We're in the middle of an escalating information-war. Trump and Sulzberger, the NY Times publisher, meet, talk, and then launch charges at each other. Sulzberger claims Trump's attacks on MSM could result in violence against journalists. I thought I'd boil a few things down and simplify them for AG Sulzberger, the 37-year-old publisher of the Times. He and his paper are fake for several reasons---one is, they don't follow up on their own best stories. It's called continuing investigation---and they don't do it. It's their duty, and they are grossly derelict. Two examples, both from the spring of 2015. On April 23, the Times ran a story under the headline: "Cash Flowed to Clinton Foundation Amid Russian Uranium Deal." The piece made an excellent circumstantial case for Hillary and Bill as key players in a criminal scheme to sell 20% of US uranium to Putin. But...no serious follow up. No deeper investigation. No pressure on the players. Just one and done. Ditto for a 3/15/15 Times story, "Protection Without a Vaccine." The article details a revolutionary candidate for next- generation vaccines---injecting synthesized genes into the body to "protect against disease"---and thereby permanently altering the vaccine recipient's DNA. The story is nothing less than a revelation about a plan---right out in the open---to do genetic engineering on billions of humans who get vaccinated. No speculation necessary. Here is the same pattern, from the Times' chief competitor, the Washington Post (9/4/13), "When the US looked the other way on chemical weapons"): "...The administrations of Ronald Reagan and George H.W. Bush authorized the sale to Iraq of numerous items...including poisonous chemicals and deadly biological viruses, such as anthrax and bubonic plague..."
Here's another Post story---October 15, 2017, "The Drug Industry's Triumph Over the DEA": "In April 2016, at the height of the deadliest drug epidemic in U.S. history, Congress effectively stripped the Drug Enforcement Administration of its most potent weapon against large drug companies suspected of spilling [trafficking] prescription [opioid] narcotics onto the nation's streets." "So, Senator, why haven't you introduced a new bill to cancel the damaging one you helped pass in 2016? In your home state, the latest reports show there are at least 100,000 opioid addicts, 800 of whom have died. Don't you want to let the DEA do its job? What are you waiting for?" "This is outrageous. You're accusing me of---"
"We've conducted a poll in your state. Your constituents want to know what you're doing. So tell them..."
"How? Exactly how are you active? Yesterday, we interviewed the mayor of your home town. He's a Democrat like you. He says you've done nothing to stem the tide. We've put together a list of pharmaceutical money you've taken over the past ten years..."
They have the resources and the reporters, but they don't follow up on the most crucial stories they cover. They refuse. They "move on." If they'll comment at all on this glaring dereliction of duty, it's: "Well, we already covered that." "It's old news." "Our readers aren't interested in that anymore." "Mounting an ongoing investigation would cross the line into making the news instead of reporting on it." Etc., etc. Of course he won't, because he's fake. 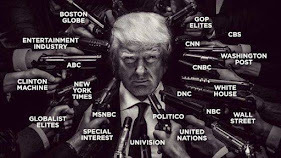 And oh yes, one other thing, via Gateway Pundit: "NYT Publisher Complains to Trump About 'Potential' Violence Against Journalists - Ignores Over 500 Violent Attacks on Trump Supporters." "There have been over 538 violent attacks against Trump supporters since the 2016 election season."